The shimmering titanium landmark of the Museo Guggenheim Bilbao is familiar to most and the museum now attracts visitors from around the world, so much so that Bilbao has now matured into a major European art centre. But at heart it remains a hard-working town, and one that has real character. It’s this down-to earth soul, rather than its art galleries, that is the real attraction of the vibey, exciting and cultured city of Bilbao. Our guided tour takes in the absolute highlights of the city including the Museo Guggenheim. Set by the river, it’s visible almost everywhere you look. Designed by Frank Gehry, this abstract of glass, stone and titanium scales is as striking inside as outside. Inside there are permanent collections to visit, most notable is Richard Serra’s massive curved steel walkthrough installation, 'The Matter of Time', but the art outside has possibly even more impact. There’s something weird and wonderful about walking past Jeff Koons’ flowery Puppy and Anish Kapoor’s big pile of steel balls or gazing upwards between the legs of Louise Bourgeois’ Maman spider. Known as the city of wanderers, walking around can be the best way to explore a new place. Just across the river from the ultramodern Guggenheim lies the Casco Viejo or Medieval Neighbourhood, a maze of cobbled streets, tiny bars and buzzing restaurants. Here the many bars are piled high with pintxos, the Basque Country’s take on tapas, which are a great way of sampling regional specialities for a few Euros. Take your time to crawl your way through the winding streets, stopping every few yards to dive into the bubbling, welcoming cachophony of another friendly bar. Eating in Bilbao can be a noisy, chaotic but ultimately wonderful and delicious experience and the proliferation of Pintxos bars makes this even more enjoyable. Among the dishes to try are alcachofas en tempura con crujiente de jamón (artichoke tempura with crispy jamón); anchoa marinada con huevos de lumpo y salsa tartára (marinated anchovy with lumpfish eggs and tartar sauce), txangurro gratinado (spider crab au gratin). The best plan is to find a stool at the bar and try whatever takes your fancy that’s within reach! . Just a 10 minute walk from the Old Town and about 800 yards from the Guggenheim Museum. Our modern and functional interior view rooms all feature flat-screen TV, air-conditioning, coffee maker, hairdryer, safe and free Wi-Fi. This perfectly located hotel offers a restaurant and cocktail bar. 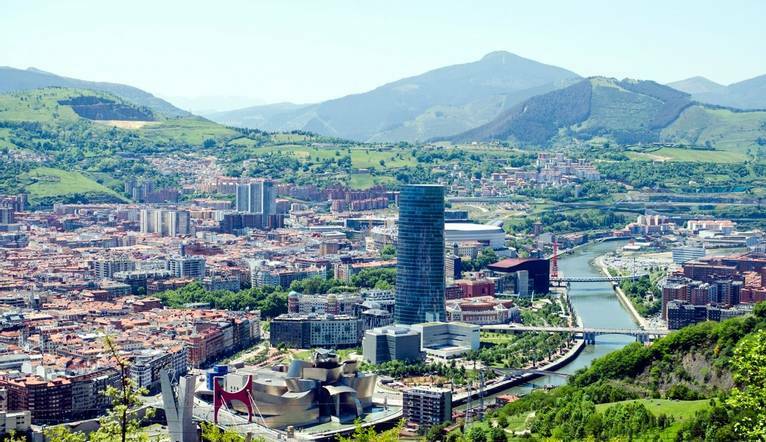 The transfer time from Bilbao Airport to the hotel is approximately 20 minutes depending on traffic. Optional tours may be available to you depending on the time of year and numbers interested. All tours can be paid for in Euros but in cash only. The exact amount will be given at your Information Meeting. Your Tour Leader will help arrange these for you but may not necessarily accompany you. Your Tour Leader will be on hand to offer advice or suggestions if required but gratuities are offered entirely at the sole discretion of the individual. We suggest a group collection to cover drivers, porters and hotel staff of €15.00. Your Tour Leader will collect this on your behalf and distribute it accordingly, thus relieving you of the burden of who, when and how much to tip. The tipping of housekeeping will be left to your individual discretion (a small amount left in your room on departure should cover this and would be much appreciated). As is customary, ‘the hat’ will be passed around for the driver and guide on all optional excursions. For any meals that are not included in your itinerary, or taxi fares, your Tour Leader can advise of an appropriate % add on.